Cruising through the maze-like, icy channels of the legendary Northwest Passage is like sailing deep into the history of the High Arctic. On this immersive 17-day expedition through the fabled sea route, you’ll explore the same landscapes and waters that have enchanted adventurers for hundreds of years, tracing their footsteps. Pay your respects at the final resting place of three of Sir John Franklin’s lost crew. Visit traditional Inuit communities, and bone up on ancient cultures at remote historical sites. Learn about the whaling heyday of the 1800s and, if you’re lucky, spot present-day whales frolicking in their natural surroundings. On this active adventure, Zodiac, kayaking and hiking excursions make it easier than ever to encounter the unique wildlife that call this mysterious realm of dramatic fjords, glaciers and mountains home. Your arctic expedition begins in Ottawa. Explore Canada’s capital city on your own before spending the night at your well-appointed hotel. After breakfast, board your charter flight to Kangerlussuaq, a small seaside community that’s your gateway to Greenland. Enjoy your first Zodiac ride as you’re transferred from shore to ship. Out on deck, take in your new surroundings before you set sail on your arctic adventure. Locals call Maniitsoq the Venice of Greenland, as it’s situated in an archipelago intersected by natural canals. Soaring, snow-capped mountains surround the small, rocky town, whose name means “the uneven place.” Playful humpback whales spend summer in the waters around here. The Greenlandic capital of Nuuk is a haven for history and culture lovers. Stroll down to the waterfront to see the Hans Egede Church and Hans Egede statue, named for the missionary who established the settlement in 1728. Marvel at the famous remains of 500-year-old fully dressed mummies, discovered under a rock outcrop in 1972 by two brothers out hunting, at the Greenland National Museum. The Nuuk Art Museum and Katuaq Culture Centre are also worth visiting. 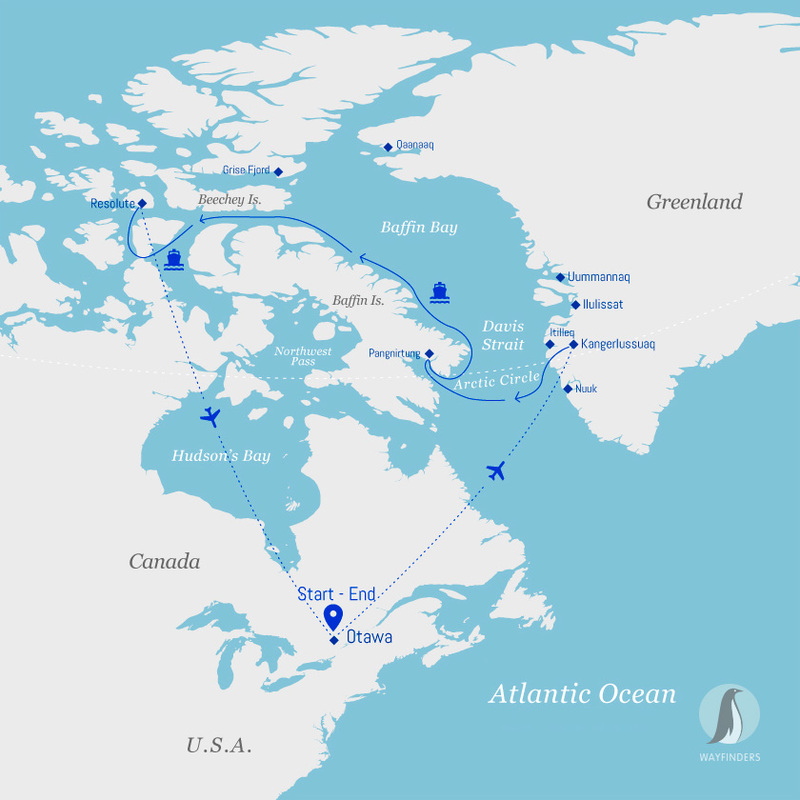 Say goodbye to Greenland’s shores as you traverse the Davis Strait in pursuit of the Canadian Arctic. Presentations by on-board experts will prepare you for the adventures that lie ahead. 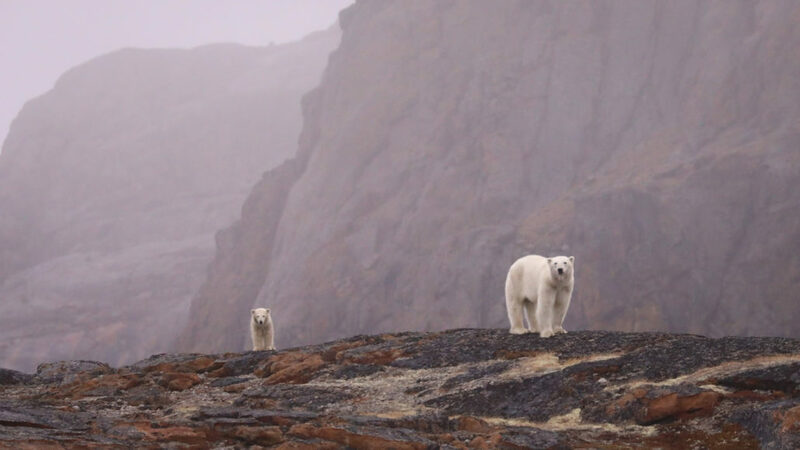 Visit towering fjords, historical sites and traditional Inuit communities as you follow the footsteps of famous explorers from long ago in the Canadian High Arctic. The picturesque Inuit hamlet of Pangnirtung, nicknamed the Switzerland of the Arctic, is nestled beneath the jagged peaks of Mount Duval. An artist’s hub, Pang is renowned for its traditional Inuit arts and crafts, especially lithographs and intricate tapestries. At the Uqqurmiut Centre for Arts & Crafts, watch craftspeople in the tapestry studio and pick up a limited-edition print. A must for visitors, a colorful Pang hat will keep you warm during the remainder of your arctic voyage. You’ll also visit nearby Kekerten, an uninhabited island that was a major whaling destination in the 1800s. At the southern tip of the Cumberland Sound, Cape Mercy was named by British explorer John Davis (yes, he of the Davis Strait), who sailed through it in 1585. The site of an old Distant Early Warning Line installation, it’s an ideal spot to go ashore for a hike. As icebergs travel down the Davis Strait, they’re naturally trapped at Qikiqtarjuak (formerly known as Broughton Island), the iceberg capital of the world. The icy waters here are sometimes also home to narwhals, beluga and right whales, and ring and harp seals. A hike up to the hilltop inukshuk (a stone figure made by the Inuit) rewards with spectacular views of the community. Cruising farther north along the east coast of Baffin Island, we’ll approach Isabella Bay, an important summer and fall feeding area for a large population of bowhead whales. Stacked side by side, the dozens of soaring cliffs of Sam Ford Fjord make for a majestic site as you sail by. One of the most isolated places on the planet, the big-wall playground attracts climbers eager to scale the sheer rock faces that shoot straight out of the sea. At the northern tip of Baffin Island, near the eastern entrance to the Northwest Passage, is the picturesque hamlet of Pond Inlet. Spend some time exploring this traditional Inuit community that’s surrounded by scenic mountains, fjords, glaciers and icebergs. The area around Lancaster Sound affords several hiking opportunities. At Dundas Harbour, on Devon Island, you’ll visit an abandoned beachside outpost of the Royal Canadian Mounted Police. At nearby Croker Bay, cruise in a Zodiac (at a safe distance) along the face of an actively calving glacier. Your Expedition Team will also keep its eyes peeled for the muskoxen and walrus that are known to visit the bay. A hike to a nearby archaeological site is another possible excursion. Farther west, some of the best ancient Thule remains in the Arctic are at Radstock Bay, beside the soaring Caswell Towers, a polar bear observation site. Exploring the area, you’ll gain insight into how these pre-Inuit people lived. At the western end of Devon Island, the windswept Beechey Island might be small, but it’s steeped in history. Named after famed British explorer Frederick William Beechey, it’s a Canadian National Historic Site. You’ll visit the small marked graves of three crew members who died during Sir John Franklin’s tragic 1845–46 expedition. Roald Amundsen landed here in 1903, during the first successful voyage by ship through the Northwest Passage. Sailing down the east coast of Somerset Island, you may have a chance of spotting beluga whales and narwhals, as they feed on the large numbers of arctic char that enter Creswell Bay in late summer. An Important Bird Area, the bay also attracts such species as black-bellied plovers, king eiders and white-rumped sandpipers. You’ll also have time to explore Fort Ross, where the Hudson’s Bay Company established a now-abandoned trading post in 1937. At the midpoint of the Bellot Strait, a narrow channel that separates Somerset Island from mainland North America, you’ll reach the northernmost area of the continental landmass, Zenith Point. After disembarking in Resolute, you’ll be transferred to your charter flight to Ottawa, where you’ll spend the night at your included hotel. Today, make your way to the airport to catch your homeward flights, or spend the day exploring Canada’s capital city. Note: Baggage allowance on charter flights is 44 lbs (20 kg) checked and 11 lbs (5 kg) carry-on.